Mother Wrathall is a native Rhode Islander who spent much of her adult life as a special education and first grade teacher in the Westerly School Department. She received her BS in Elementary Education in 1974 and Masters in Education in 1977 from Rhode Island College. After a full career in education she answered God's call to ordained ministry, earning a Master of Divinity in 2006 from the General Theological Seminary in New York City. Mother Susan was ordained to the diaconate on Ascension Day 2006 by The Rt. Rev. David Joslin, assisting bishop in Rhode Island. On December 16, 2006 she was ordained priest by The Rt. Rev. Geralyn Wolf, 12th Bishop of Rhode Island. 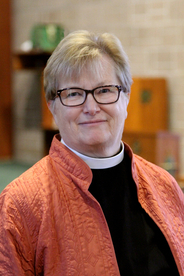 Mother Susan served as Assistant to the Rector at St. Paul's Episcopal Church in Pawtucket for almost three and one-half years before being called as the fourth rector of St. Mark's in September 2009. Mother Susan is the proud grandmother of five and is only to happy to show pictures. Sally North comes to us via Emmanuel Church in Cumberland where she was the parish administrator for 2½ years. Prior to working at Emmanuel, she worked for the Massachusetts Department of Correction retiring after a 20 year career. She recently got married, moved to Exeter RI and was looking to find a part-time job closer to her new home. We were looking for somebody with experience - a perfect match! Sally is an Episcopalian with roots at St. James Church in Woonsocket. She and her husband enjoy the beach. They moved to Exeter from Northern Rhode Island so they could be closer to the water but still enjoy living in the country. She enjoys reading, doing word puzzles, jigsaw puzzles and Sudoku. Eily is a student at Rhode Island College, interning with 3 local parishes this semester as an undergraduate Social Work major. She will be at St. Mark’s, St. David’s, and Trinity Episcopal Church in Scituate. She is 31 years old and a mother of a wonderful 6-year-old boy. She enjoys cooking and reading but most of the time she is playing with my son. She will be at the Community Lunch each month and in the office Monday mornings. Eily will be a wonderful resource for various kinds of assistance in the community.